Please refer to our stock # TLCatalog when inquiring. 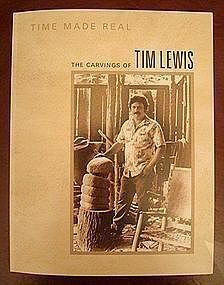 This is a great opportunity to own the catalogue for the traveling museum show "Time Made Real: The (Stone) Carvings of Tim Lewis", especially if you are unable to get to one of the exhibition venues, which run through December 2009. Loaded with images and showcasing the 60 powerful works of art in the premier exhibition at the Customs House Museum in Clarksville, TN, the catalogue is peppered with great photographs of Tim at work and with his family. It is also a scholarly work that stands on its own with entertaining and insightful essays by well known and long time folk art experts, collectors, writers and curators. These are Michael D. Hall, Lee Kogan, Ned Crouch, Dan Prince, Kathy Moses, and Frank Holt. The catalogue is an educational tool for those who are new to folk art and for sophisticated collectors as well. The show will remain in Clarksville until October 31 then moves on to Columbus (Ohio) Museum of Art November 14th, 2008 through February 22nd, 2009; then on to the Mennello Museum of American Art (Orlando, FL) April 15th, 2009 through June 30th, 2009, and winds up at Kentucky Folk Art Center, Morehead State University, Morehead, KY October 1st through December 30th, 2009. The catalogue leaves no doubt in anyone's mind that contemporary folk artist and stone carver Tim Lewis is a true twenty-first century talent. 63 pages. 8-1/2 x 11 inches. $20 + SHI.